The classic pumpkin pie is as traditional as it gets when it comes to Thanksgiving dinner desserts. 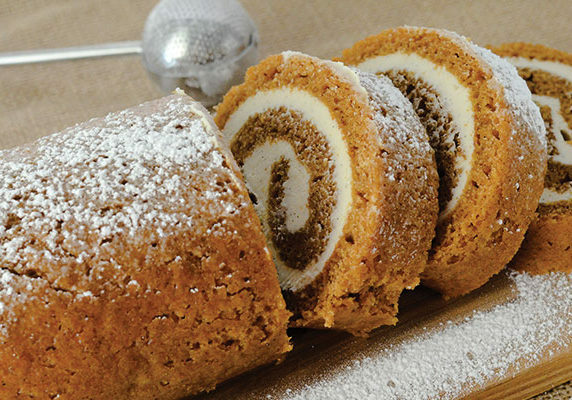 But if you are looking for something different this year, this pumpkin roll is an excellent alternative. Made with moist pumpkin cake and mouth-watering cream cheese filling, this Pumpkin Roll is surprisingly easy to make! Prepare a 15 x 10-inch jelly roll pan by lining it with parchment paper. Leave an extra 1-inch of parchment sticking up on both 15-inch sides of the pan to make it easier to lift the cake out after baking. To make the pumpkin cake, dump together flour, baking powder, baking soda, cinnamon, ginger, nutmeg, cloves and salt in a large bowl and whisk until well-combined. In a separate bowl, beat eggs and granulated sugar for 1 minute until thick. Add in the vanilla and pumpkin puree and mix well. Fold in the flour mixture with a rubber spatula, and stir together until just combined. Pour over and spread the batter evenly into prepared pan. Bake for 13 to 15 minutes, or until top of cake springs back when touched. While still warm, carefully lift the parchment paper and cake out and lay onto a flat (and heat-safe) surface. Without removing the parchment paper, slowly roll the cake from short end to short end using your hands until it is completely rolled up. Transfer the cake roll to a wire rack, and cool until it reaches room temperature. While waiting for the cake to cool, prepare the cream cheese filling. Whisk together cream cheese, powdered sugar, butter and vanilla extract in a mixing bowl until smooth. The consistency should neither be too thick that it is difficult to spread nor too thin that it oozes out of the cake when you roll it up again. If the consistency is too thin, add more powdered sugar. If too thick, add a half teaspoon or two of water. Once the filling is ready and the cake roll has reached room temperature, transfer the cake onto a flat surface and carefully unroll it until it is flat again. Using a spatula, spread the cream cheese mixture evenly over cake, leaving a 3/4-inch border on all sides. Then carefully re-roll the cake, gently peeling away the parchment paper as you roll until you can completely remove and discard it. Tightly wrap the pumpkin roll in plastic wrap and refrigerate at least one hour for cake and filling to set. Gently remove and unwrap the pumpkin roll and transfer it to your serving dish. Lightly dust the pumpkin roll on top and sides with powdered sugar, if preferred. Slice and serve. Store leftover pumpkin roll in air-tight container or by wrapping in plastic wrap. It can be stored in the refrigerator for up to 3 days.